SERIES: 2nd in the Paradox series, follows Fortune's Pawn. Devi Morris has lots of problems - and not the fun, easy-to-shoot kind either. After a mysterious attack left her short of several memories and one partner, she's determined to keep her head down, do her job and get on with her life. But even though Devi's not looking for it this time, trouble keeps finding her. She sees ghostly creatures no one else can, the inexplicable black stain on her hands keeps getting bigger and she can't seem to stop getting into compromising situations with a man she's supposed to hate. But when a deadly crisis exposes far more of the truth than she bargained for, Devi discovers there are worse fates than being shot - and that sometimes the only people you can trust are the ones who want you dead. I guess the first thing I should say is that there's no point you reading this book if you haven't read the first one, Fortune's Pawn. It absolutely does not stand alone (and neither did book 1, which ended in a somewhat annoying cliffhanger). Furthermore, you shouldn't read this review if you plan to read book 1 at all. So, those of you who did read Fortune's Pawn will remember that it ended with Rupert scrubbing all of Devi's memories relating to the Big Secrets he and Caldswell are keeping. 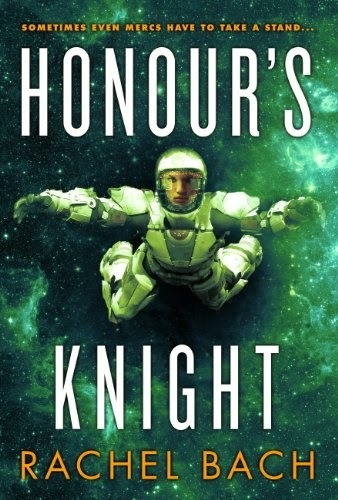 Honor's Knight starts pretty much straight afterwards. Devi wakes up after an injury thinking all is perfectly normal. There are things she doesn't remember, like what on earth happened in the xith'cal ghost ship, but that's not unusual given the trauma she endured. The only strange thing is the revulsion she feels whenever she sets eyes on the ship's cook, whose name she can't quite remember. I wasn't crazy about that development, because it felt to me like going back to square one, erasing all the progress that was made in the first book. A bit like "it was all a dream", if you will. I was glad to see that this state of affairs didn't last long, and Devi was soon in possession of all the knowledge she'd acquired, plus a hell of a lot more. The situation Bach creates is one that I thought was fascinating. There are two sides here, both with basically the same final objective. They want the same thing, but their methods are so diametrically different that it has led to enmity, and with very good reason. The discussion is about whether the ends justify the means, as long as the ends are crucial enough to the survival of the entire universe, and each side has a different answer to that. Devi must make up her own mind. I liked that I could see both sides here and understand their logic, even though, like Devi, it was very clear to me what side I was on. Devi rings completely true to me as a mercenary. The way she thinks feels real, especially the things she's not bothered by (e.g. killing people/beings who are combatants and know exactly what they're getting into) and the things she is... how she feels that some of the actions taken by both sides (but especially one) just cross a line that shouldn't be crossed. I also really liked that the romance gets very complicated here. Rupert has done and does here things that could be seen as unforgivable. They are not excused. I truly don't know how Bach will move this forward, but I want to find out. The ethical dilemma is played out in the midst of non-stop action that never gets dull. Bach has a gift for writing action scenes in a way that's very cinematic and allows the reader to know exactly what's going on. That's not easy to do, and many authors get it wrong. Finally, we also get to explore quite a bit of the universe, including planets populated by non-humans. I don't completely buy the aeons, but I was quite excited about this, and I want more! It's compulsive reading, isn't it? I hated the amnesia thing too, but I thought it was handled relatively well. Looking forward to your thoughts on the 3rd book/trilogy as a whole. I read her self-pubbed UF after finishing the trilogy, and think I've a new auto-buy author! Absolutely. You really want to know how on earth Devi will get out of the huge mess. I've finished book 3 now, and I think the trilogy gets better with every book. I'm not a fan of UF (I'm fine with the idea of it, it's just that so very few books in the genre work for me), but I might give hers a try anyway.